he Story of the Great Republic is a soft-bound 8-1/2×11 inch book of 252 pages. There are 79 chapters, with each chapter consisting of two to three pages of text. 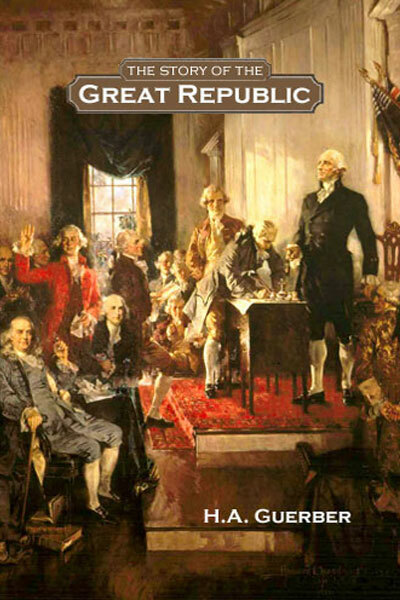 The cover art is taken from Scene at the Signing of the Constitution by Howard Chandler Christy, in the United States Capitol Building, Washington, D.C.
What time period of history does this book cover? The Story of the Great Republic opens right where The Story of the Thirteen Colonies leaves off, with the establishment of the new nation following the close of the War for American Independence. It continues with the history of the United States throughout the nineteenth century, ending with the assassination of President McKinley in 1901. Westward Expansion and the Civil War are thoroughly covered in Guerber’s unique style. What stage / age of children is this book appropriate for? This book, like all the others in Guerber’s history series, is meant for a child’s first introduction to the history of the American nation. It was written with fifth graders in mind, which is the age we recommend it is read (however, it still remains a child’s first introduction to history, no matter what age history study is begun). The volume can be read by fifth graders independently; it also remains very appropriate for a history read-aloud for any children in the elementary grades. Although we encourage everyone to use the Guerber histories, including The Story of the Great Republic, with their children in the elementary grades, we have heard from many parents whose teens read these histories with great enthusiasm. Do you have a question about The Story of the Great Republic?